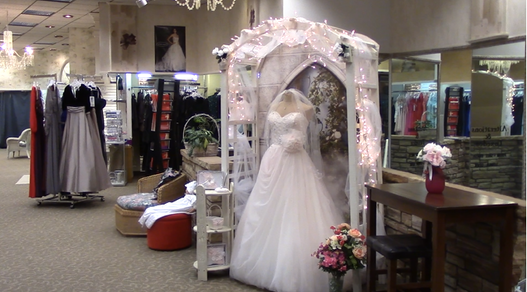 Welcome to Lund & Taylor Bridal Gallerie. We are a full service bridal salon in Rhinelander, Wisconsin. We're proud to offer wedding gowns, bridesmaids' dresses, and tuxedos from top lines such as Mori Lee and others. We also carry anything else you'll need for a wedding or other special occasion: shoes, undergarments, mother of the bride dresses, prom dresses, children's formal wear, and much more. Stop in today and let our friendly and professional staff assist you with finding the right dress, doing alterations, and making sure your big day is as special as can be. ©2019 Lund & Taylor Bridal Gallerie. All rights reserved. Disclaimer: All information is deemed reliable but not guaranteed and should be independently verified. Neither Lund & Taylor Bridal Gallerie nor By Request LLC shall be held liable for any typographical errors, misinformation, or misprints.